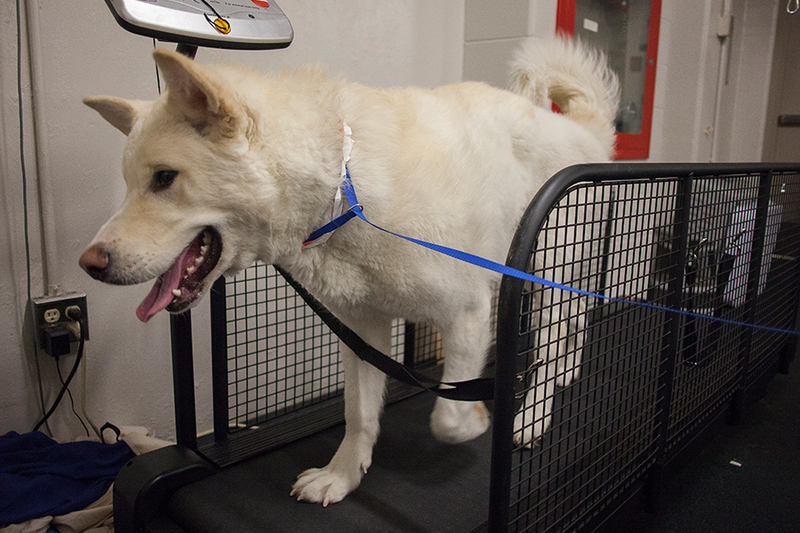 Angus uses a pet treadmill for physiotherapy following his accident last August. After getting hit by a car and sustaining a multitude of injuries, hope was fleeting for Angus, a three-month old Alaskan malamute from Kindersley, Sask. Angus' owner, Tyrone Kennedy-Bush, rushed him to the WCVM Veterinary Medical Centre, where he spent five days on a ventilator in the intensive care unit. Before the ventilator was stopped, a tracheostomy tube was also placed in Angus' windpipe. Once he was taken off the ventilator, the breathing tube ensured that the puppy had a steady supply of oxygen in case the swelling in his facial area and larynx prevented him from breathing properly. "We stopped the ventilator and everybody just kind of waited, hoping he would continue to do well," said Dr. Jewel Milo, the small animal internal medicine resident who worked on Angus' case. "He was off for almost an hour and still doing well, and awake at this point. His dad [Kennedy-Bush] kept telling us he's very food motivated—he's going to want to eat when he wakes up. And he did." Milo adds that when dogs wake up after being unconscious for so long, usually the biggest challenge is getting them to eat. Kennedy-Bush believes the breathing tube played a role in Angus' recovery by allowing him to be able to eat once he was awake. "He survived the odds," said Milo, smiling. "I'm still amazed at this dog, at how well he's done. There are not many dogs that have been on a ventilator for five days and come off." Angus' story is remarkable, but it speaks to the skill and determination of the team who took care of him through those critical first days. Angus on the road to recovery from WCVMToday on Vimeo. See more at WCVM Today.